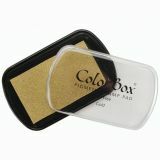 ColorBox Metallic Pigment Ink Pad - CLEARSNAP-ColorBox Metallic Pigment Inkpad. This premium quality metallic pigment inkpad with a high top case features acid free, archival, water based, easy clean with soap and water, fade resistant and unconditionally guaranteed pigment ink. Case measures: 2-1/2x4in. Made in USA.